We These are difficult to keep in stock - therefore Please contact us direct for availability . 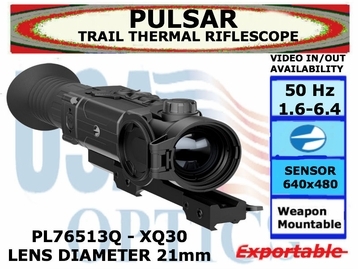 The Pulsar Trail XQ30 Thermal Riflescope boasts advanced, user-friendly features, unheard of in its class. Get on target from any distance with the Trail XQ30's variable 1.6-6.4x magnification, delivering quality heat signatures up to 985 yards away. The XQ30 eliminates the need for extra batteries with a convenient rechargeable 8-hr. battery pack. Capturing footage of your experience has never been easier with built-in video recording, 8gb of internal memory, rich 17µm 384x288px resolution, a frost-resistant 640x480 AMOLED display and Stream Vision App compatible Wi-Fi. IPX7 waterproof, fogproof and dustproof, the Pulsar Trail XQ30 performs flawlessly in temperatures ranging from -13° to 122°F and delivers ultra-easy user interface with ergonomic button locations. The XQ30's popular "white hot" and "black hot" modes, 13 digital reticle options and 50Hz refresh rate provide users with fluid imaging, customized thermal mapping and a richly contrasted field of view. Proprietary picture-in-picture (PiP) ensures repeatable, precision accuracy. Additional features include a built-in accelerometer, stadiametric rangefinding, convenient carrying case and wireless remote.